The boys helped my Granny move into her new apartment a few months ago and absconded with a cute lighthouse figure which made it's way into our house. I used it as inspiration to create a "nautical" themed bathroom for them. I used this amazing Take Me To The Sea print by Katie Daisy and taped it to the wall with cute washi tape (I've made way too many mistakes hammering nails and hanging crooked pictures). 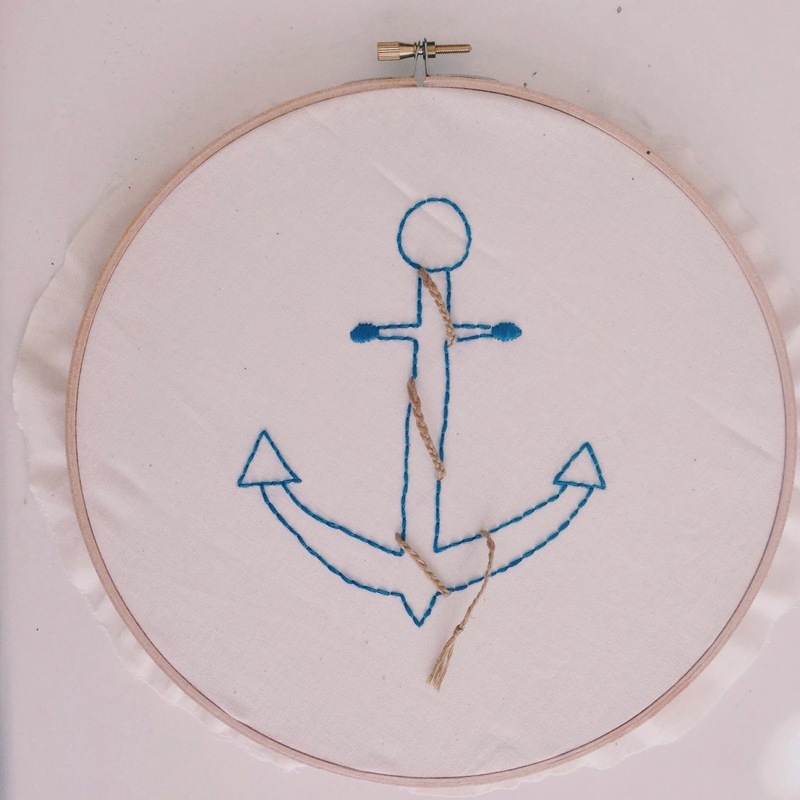 Then, I took some scrap fabric and embroidered this fun anchor hoop art! I drew the design on the fabric with a pencil and then just went to town on it! I love the little braided "rope" that I added last minute. It gives the artwork depth and texture. I love what I have in their bathroom so far, but I definitely plan to add a few more treasures and knick knacks over time. 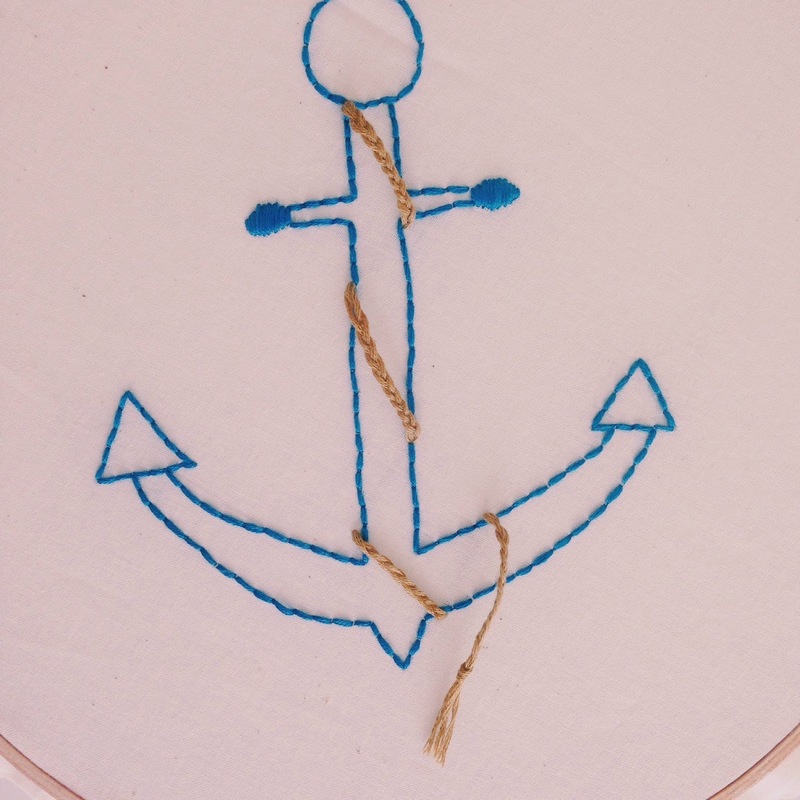 Do you have any ideas for a good nautical diy!? I'd love some inspiration! I am so excited to be a new crochet contributor over at I'm Topsy Turvy and today my first post is up and running! Each month, I will be focusing on just one stitch with my crochet patterns to help beginners learn one step at a time, and to give advanced crocheters a chance to hone their skills. Today, I used a simple single crochet to create a fun nautical belt! The belt features a sailor's knot and will be so cute to wear over a spring or summer dress! Ashlee, who runs I'm Topsy Turvy, is also an avid crocheter and you can find a lot of amazing patterns on her site! Stop by today and let me know how your Sailor's Knot Belt turns out!